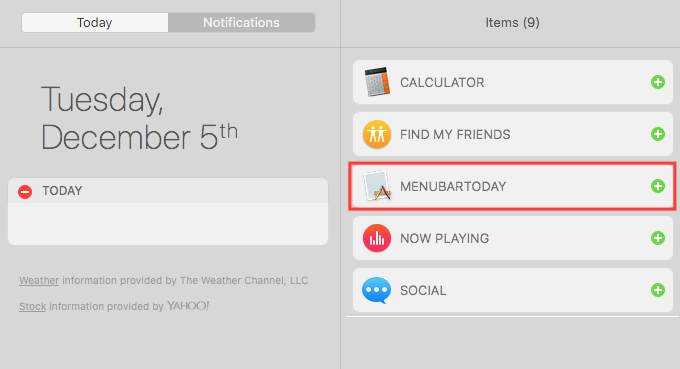 I'm trying to remove unused Today widgets from the Notification Center panel, although it's not clear on how to get rid of them (delete permanently). The unused items show up after clicking the "Edit" button at the bottom of the Today Screen, but the only thing that the +/- seems to do is either add it to the panel or put it in a pile of unused widgets. I would like to remove some third party today widgets entirely, as I don't even have the application installed any longer. The following assumes you've got a widget called ExampleWidget. Ensure that you've removed the application, even if it's running out of your Downloads folder. Not the answer you're looking for? Browse other questions tagged macos finder high-sierra dashboard-widget . Today & Tomorrow Summaries re-add to Notifications on reboot.